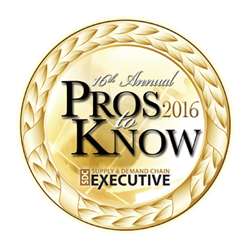 Supply & Demand Chain Executive magazine, the executive's user manual for successful supply and demand chain transformation, recently announced the 16th annual listing of ‘Pros to Know’ in the supply chain industry. UltraShipTMS Director of Application Development, Shannon Potter, is named to the list for 2016. The Pros to Know Awards recognize supply chain executives leading initiatives to help prepare companies’ supply chains for the significant challenges of today’s business climate. This year’s list includes more than 200 individuals from software firms and service providers, consultancies or academia, who helped their supply chain clients or the supply chain community at large prepare to meet these challenges.